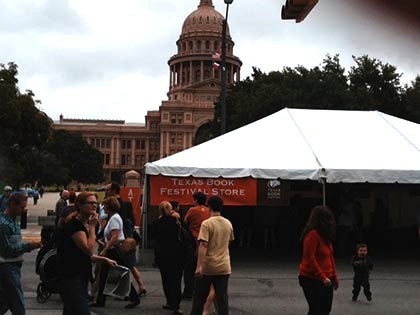 I made it out to the Texas Book Festival on Sunday and really enjoyed a couple of author chats. The first one was titled “Idols” and novelists Shawn Vestal and Manil Suri talked about gods, proselytizers, apostates, and more. How’s that for a casual chat on a Sunday? I didn’t want to miss this talk as I had read Manil Suri’s Death Of Vishnu years ago and thought it was such a great novel. Both authors read from their new books and talked about their relationship with religion and why they incorporate it into their novels. I was surprised at how funny both authors were and I especially enjoyed hearing how Manil Suri, who is also a mathematician, approached writing his latest novel and even offered mathematical proof to his editor that he couldn’t finish it. So funny. I have Suri’s second book, , somewhere on my shelves and I need to find it. The next session introduced me to authors Nina McConigley, Jean-Christophe Valtat and Mario Alberto Zambrano. I wanted to attend this because I know several of you recommended Zambrano’s novel but I hadn’t heard of the other two authors and I’m so glad I didn’t miss this. Nina wrote Cowboys and East Indians which draws from her personal experience living in Wyoming. Jean-Christophe Valtat novel Aurorama has been labeled Steampunk and he thinks it is also a bit of dreampunk. I like that. Finally, Mario Alberto Zambrano talked about his connection to the Loteria game and how he was able to build a story from the pictures on the Loteria card deck. All three were really interesting and I’ve added their books to my TBR list. 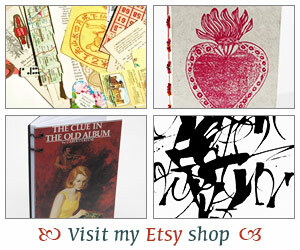 A book festival isn’t a festival without a bit of shopping right? I had to visit the Penguin Truck and although they didn’t have many books to choose from I was happy to find two beautifully bound books: Haunted Castles: The Complete Gothic Stories by Ray Russell and The Thing On the Doorstep and Other Weird Stories by H.P. Lovecraft, which are perfect reading for this season. If anything I’ll be ready for next year’s R.I.P. Challenge right? 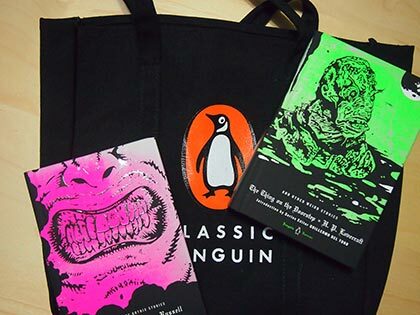 Apparently there are four more books that make up the Penguin Horror collection. I want them all. Oh and I also got a cool Penguin tote. And, a funny note, I ran into a book group member from a group I belonged to in Dallas! We didn’t get to talk much as we were both rushing off to our respective talks but isn’t that nice? I did a very quick visit through some of the other vendor booths, skipping Barnes & Noble and Bookwoman as those are local shops and I visit regularly, but I and saw way too many things that I wanted like these cute shirts from Novel T. Anyway, lots of fun and I’m already looking forward to next year’s festival. That sounds like it was a blast! I love these festivals and you always seem to discover a new author and new books you need to read…usually local authors and I love to support them. It’s the second year in a row I didn’t make it, but I had plans to visit my best friend in Dallas. We had a great time, but when I remembered what I was missing, I felt a little twinge. But this year, there weren’t any authors I was dying to see. Hope next year is different! Glad you had such a good time, though. There’s always something fun to see at TX Book Fest! I was salivating over the idea of the Penguin truck. I love that Horror Series! ONE DAY I will make it to the festival. Sandy – You are right, festivals are a great opportunity to support local authors. I missed out on seeing some local writers in this festival but hopefully next time! Jenn aka the Picky Girl – Oh funny I almost went to Dallas this weekend but am glad we’ve rescheduled our trip for another time. Well, there’s always next year so hopefully you’ll get to make it to the one. 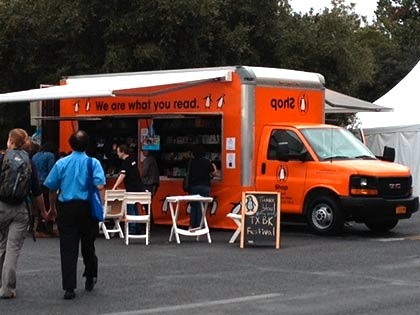 Did you know that San Antonio also has a book fest? It’s sometime in April. I need to look into that! The book festival sounds like so much fun! I don’t recognize those authors, but it’s always interesting to learn about new writers. I’m glad you enjoyed it. What a fun day! And a Penguin truck! I wonder how we can get one of those at our book festival next year?